Warning! This article contains math! 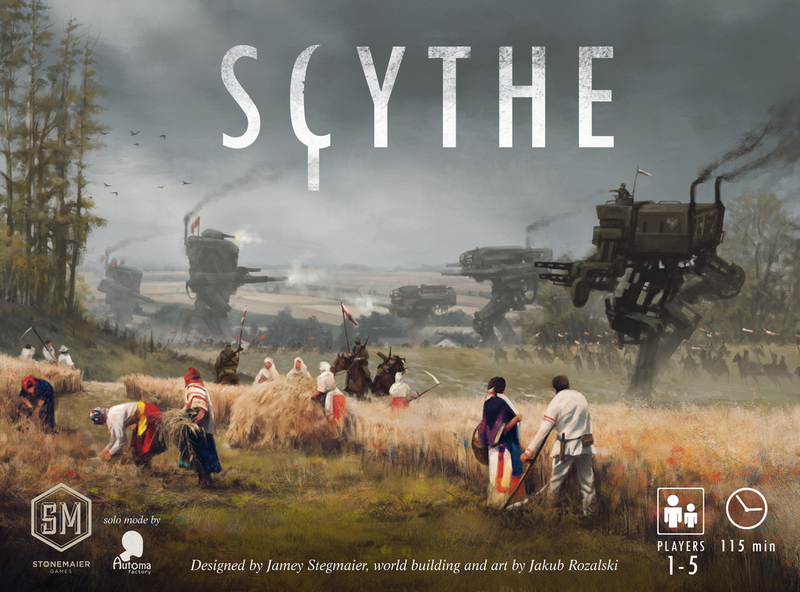 I’d like to introduce you today to one of my favorite games: Kingdom Builder. 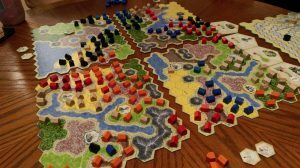 Kingdom Builder is an area control game by Donald X. Vaccarino (the creator of the deck building game Dominion) for 2-4 players that won the Speil des Jahres in 2012. 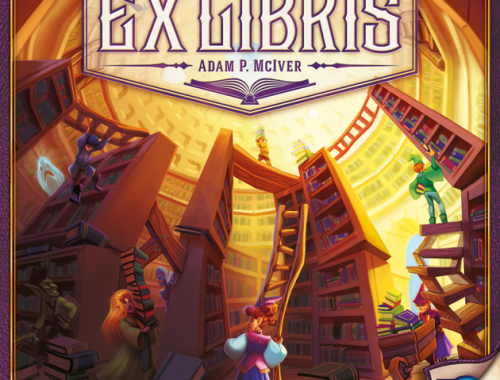 The Spiel des Jahres is an award given to one game a year for “excellency in game design” and those games usually end up among my favorites. 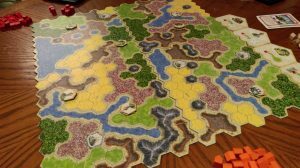 Kingdom Builder is a very fast game to set up, play, and score. We averaged a set up time of around two minutes, with an average play time of about 30 minutes (some combinations take planning while others are more straight forward). For your first time playing and reading the rules I’d expect about 45 minutes. Anyway, to play Kingdom Builder you get one card a turn, which tells you the type of terrain on which you can place your settlements. 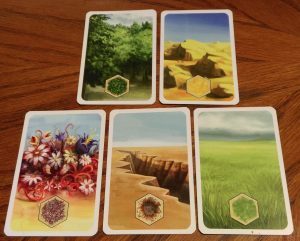 There are 5 playable terrains, grasslands, forest, desert, flowers, and canyon, and two unplayable terrains, water and mountain. You can also get bonus tiles that give you free settlements or allow you to move your existing settlements. The key rule to the game is that, if possible, your new settlements have to touch your current settlements. The formula for combinations is where x! represents x factorial, n is the number of choices, and k is how many you choose. Factorial in long form means x*(x-1)*(x-2)…*(x-(x+1)). I won’t bore you with the derivation of the formula, but you can look it up on Wikipedia here! So from the ten cards, and selecting three the formula looks like this: or or in long form luckily we can eliminate some numbers because they are on both the top and bottom of the divisor leaving us with: which simplifies to 720/6 or 120. Replayability is also increased by the unique board set up. The game includes eight different boards, each with their own terrain combinations and bonus tiles. You shuffle the boards and lay out four for each game. This gives us more math! We used combinations for the victory cards since the order in which you draw them doesn’t matter. For the boards we have to use permutations since the same four boards could be placed in a different order, 1234 is different from 1324. The formula for permutation of possible placements is which looks very similar to the combinations formula but grows much quicker. Since we have eight boards and choose four of them our formula is , which simplifies to . We can cancel out similar factors again to end up with 8*7*6*5 which equals 1680 possible board combinations. So when I say replayability I really mean it for this game. Taking the 120 different victory card combinations and the 1680 different board set ups there is a total of 201,600 unique games possible. Slightly fewer than the million I mentioned in the title but enough to keep the game from being the same everytime you play. If for some reason you want even more variety (oh and I do) there are now four expansions and three promo “Queenies”, each with their own new bonus tiles, victory cards, and even new terrains (true to Donald X’s style). I only have two of the expansions but my box now contains 24,460,800 unique set ups, and the ability to play with up to five players. I’ll end with some quality of life advice if you decide to pick up a copy of Kingdom Builder. 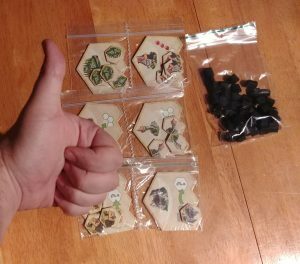 The game only comes with a few very large baggies for the pieces, so my crafty (devious, and she likes to make stuff) sister came up with a nice solution. She took a snack sized plastic baggy and used a sewing machine to stitch up the middle, creating two sealable pouches for easy sorting. This also helps with set up time since you don’t need to paw through all the pieces to find that last one. 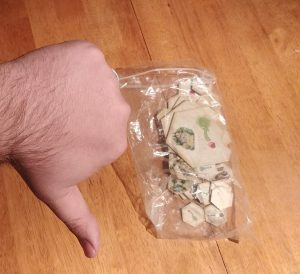 We also moved the settlement pieces to a smaller bags as well. When I purchased the expansions I removed the weird filler/sorter cardboard from the main box to allow all my boards to fit into one box. The box is pretty heavy now but I don’t have to pull down other boxes to play with expansions, everything is together and compact. 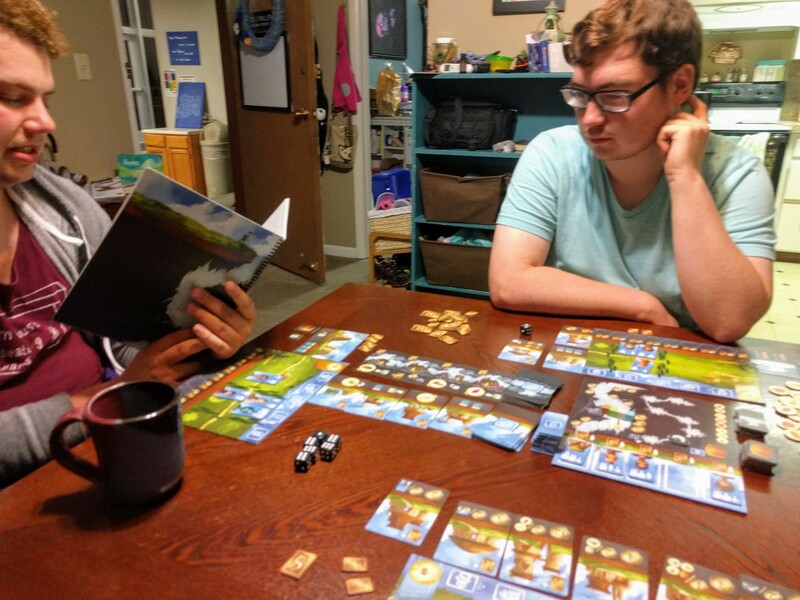 Well I hope this prompts you to try out Kingdom Builder sometime, you can always ask me to bring my copy to the Geek, I’m always happy to play, and I promise I wont talk about math (unless you want me to).